For a moment, one can imagine being late to the big Hogwarts graduation. Minus 10 points to Gryffendor! 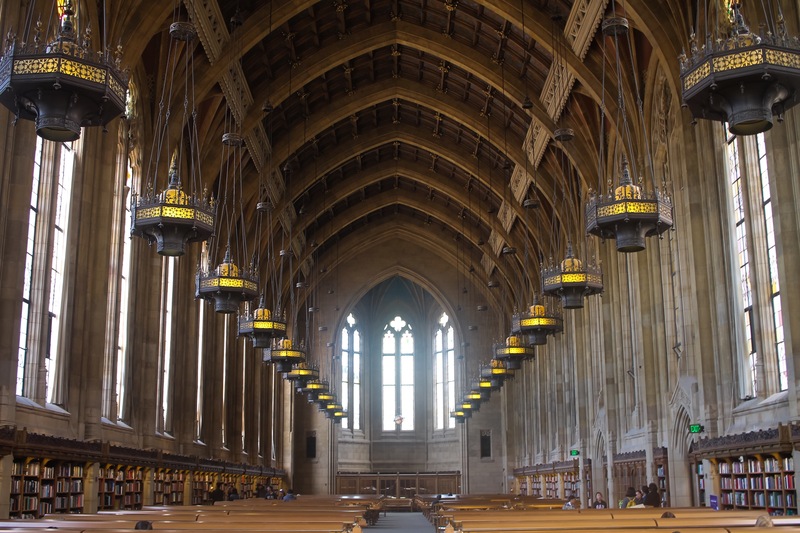 Meanwhile, this is the wonderful Graduate Reading Room on the third floor of the Suzzallo Library at the University of Washington campus. The large room was a west addition completed in 1935, to the building whose initial ground floor was completed in 1926. The area is 250-feet (76 meters) long, 52-feet (16 meters) wide, 65-feet (20 meters). Henry Suzzallo, the university president previous to the time of its completion, believed that universities should be “cathedrals of learning.” With some fantastic gothic architecture styling, the Graduate Reading Room is a vision made true for the students at U-Dub. Also, a wonderful place for quiet study, thinking, and perhaps letting the mind wander. Posted on March 30, 2016 by Orion T.	This entry was posted in Architecture, Photography and tagged architecture, gothic, libraries, Seattle, travel. Bookmark the permalink. And obviously on a sunny day, no one is studying in the library!